Carotid stenosis is a narrowing of the carotid arteries, the two major arteries that carry oxygen-rich blood from the heart to the brain. 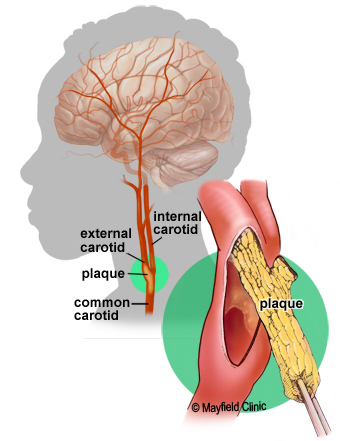 Also called carotid artery disease, carotid stenosis is caused by a buildup of plaque (atherosclerosis) inside the artery wall that reduces blood flow to the brain. Treatment aims to reduce the risk of stroke by controlling or removing plaque buildup and preventing blood clots. To understand carotid stenosis, it is helpful to understand the circulatory system of the head and neck (see Anatomy of the Brain). The carotid artery begins at the aorta in the chest as the common carotid and courses up through the neck to the head. Place your hands on either side of your neck, and you can feel your pulse in your carotid arteries. Near the larynx, the common carotid divides into the external and internal carotid arteries. The external carotid arteries supply blood to the face and scalp. 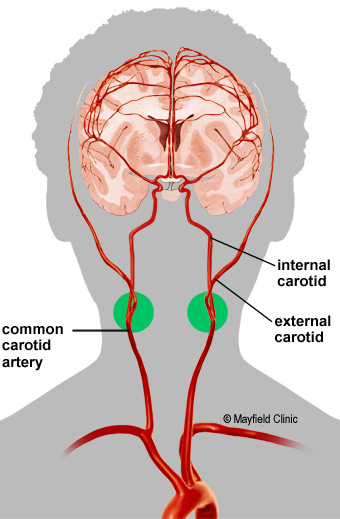 The internal carotid arteries supply blood to the brain. The most common location of atherosclerotic plaque buildup is the carotid bifurcation (Fig. 1), where the common carotid divides into the internal and external carotid arteries. Figure 1. The common carotid artery divides into the internal and external carotid arteries. The bifurcation (green circle) is the most common site of plaque buildup. Carotid stenosis is a progressive narrowing of the carotid arteries in a process called atherosclerosis. Normal healthy arteries are flexible and have smooth inner walls. As we age, hypertension and small injuries to the blood vessel wall can allow plaque to build up. Plaque is a sticky substance made of fat, cholesterol, calcium, and other fibrous material. Over time, plaque deposits inside the inner wall of the artery can form a large mass that narrows the lumen, the inside diameter of the artery. Atherosclerosis also causes arteries to become rigid, a process often referred to as "hardening of the arteries." Figure 2. A. Atherosclerotic plaque narrows the artery diameter, reducing blood flow. B. The irregular surface of the artery wall can cause clot formation that blocks the vessel or breaks off, travels downstream, and blocks a smaller vessel. Plaque deposits can grow larger and larger, severely narrowing the artery and reducing blood flow to the brain. 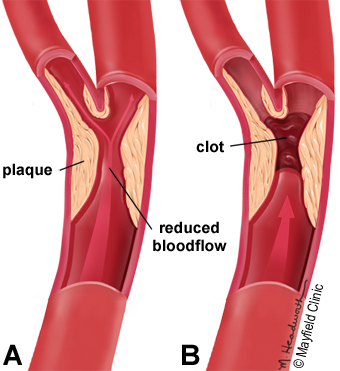 Plaque can eventually completely block (occlude) the artery (Fig. 2A). Plaque deposits can roughen and deform the artery wall, causing blood clots to form and blocking blood flow to the brain (Fig. 2B). Plaque deposits can rupture and break away, traveling downstream to lodge in a smaller artery and block blood flow to the brain. Most people with carotid stenosis have no symptoms until the artery becomes severely narrowed or a clot forms. Symptoms are most likely to first appear with a mini-stroke, also known as a transient ischemic attack (TIA). TIAs result when blood flow to the brain is temporarily interrupted and then restored. The symptoms typically last a couple of minutes and then resolve completely, and the person returns to normal. TIAs should not be ignored; they are a warning that an ischemic stroke and permanent brain injury may be looming. Symptoms of a TIA or an ischemic stroke can include weakness or numbness in an arm or leg, difficulty speaking, a drooping face, vision problems, or paralysis affecting one side of the body. If you or a loved one develops these symptoms, you should call 911 immediately. Atherosclerosis is the major cause of carotid artery disease. It can begin in early adulthood, but it usually takes decades to cause symptoms. Some people have rapidly progressing atherosclerosis during their thirties, others during their fifties or sixties. Atherosclerosis begins with damage to the inner wall of the artery caused by high blood pressure, diabetes, smoking, and high cholesterol –specifically "bad" cholesterol or low-density lipoprotein (LDL). Other risk factors include obesity, coronary artery disease, a family history of carotid stenosis, and advanced age. 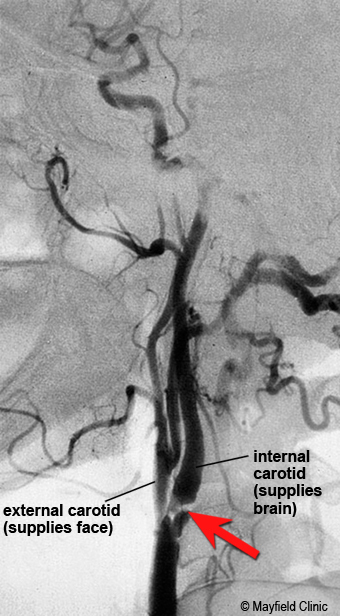 Less commonly, carotid aneurysm and fibromuscular dysplasia can cause carotid stenosis. People who have heart disease have an increased risk of developing carotid stenosis. Typically, the carotid arteries become diseased a few years later than the coronary arteries. Older people are more likely to be affected by carotid stenosis. Before age 75, men are more at risk than women. A person who has high cholesterol, has high blood pressure, and smokes is eight times more likely to develop atherosclerosis than a person without these risk factors. More than 500,000 new strokes occur in the United States each year, and carotid stenosis is estimated to cause 20 to 30% of them. Your doctor will learn as much as possible about your symptoms, current and previous medical problems, current medications, and family history. He or she will perform a physical exam. The doctor may listen to the carotid artery with a stethoscope to detect a swishing noise called a "bruit." A bruit may be a sign of turbulent blood flow caused by atherosclerosis. One or more diagnostic tests are performed to detect narrowing of the carotid arteries. Carotid stenosis is diagnosed by either a doppler ultrasound of the neck, a CT angiogram (CTA) of the neck, magnetic resonance angiography (MRA), or a cerebral angiogram. Imaging also can reveal evidence of multiple small strokes. Doctors can make a diagnosis of carotid stenosis if tests show diminished blood flow in one or both carotid arteries. You may be referred to a neurosurgeon for a surgical consultation. Figure 3. Doppler ultrasound of the carotid artery showing a narrowed artery lumen. Doppler ultrasound is a noninvasive test that uses reflected sound waves to evaluate blood flow through a vessel (Fig. 3). The ultrasound probe is placed on the neck over the carotid arteries. This test will reveal how much blood is flowing through the artery and to what degree the artery has narrowed (i.e., 100%, 80%, 70%, etc.). Computed Tomography Angiography, or a CT angiogram, is a noninvasive X-ray that provides detailed images of anatomical structures within the brain. It involves injecting a contrast agent into the blood stream so that arteries of the brain can be seen. This type of test provides the best pictures of both blood vessels (through angiography) and soft tissues (through CT). It enables doctors to see the narrowed artery and to determine how much it has narrowed. Magnetic Resonance Angiography (MRA) of the neck is similar to the CT angiogram. Contrast dye is injected through an IV to illuminate blood vessels in the neck. Cerebral Angiogram is a minimally invasive test that uses X-rays and a contrast agent injected into the arteries through a catheter in the groin. It enables doctors to visualize all arteries in the brain (Fig. 4). Figure 4. Angiogram of the carotid artery showing a narrowing of the vessel caused by atherosclerotic plaque (red arrow). The goal of treatment is to reduce the risk of stroke. Treatment options vary according to the severity of the arterial narrowing and whether you are experiencing stroke-like symptoms or not. Antiplatelet medications (aspirin, ticlopidine, clopidogrel) thin the blood and prevent clotting in the narrowed arteries, which allows blood to pass through more easily. Cholesterol-lowering statins help reduce plaque formation in atherosclerosis. Statins can reduce LDL "bad" cholesterol by an average of 25-30% when combined with a low-fat, low-cholesterol diet. Antihypertensive medications (diuretics, ACE inhibitors, angiotensin blockers, beta blockers, calcium channel blockers, etc.) help control and regulate blood pressure. Because high blood pressure is a major risk of stroke, regular blood pressure screenings are recommended. Surgical treatment is generally recommended for patients who have suffered one or more TIAs or strokes and who have a moderate to high grade of carotid stenosis [2,3]. The aim of surgery is to prevent stroke by removing or reducing the plaque buildup and enlarging the artery lumen to allow more blood flow to the brain. Carotid endarterectomy is an open surgery to remove the plaque. A skin incision is made in the neck and the carotid artery is located. Temporary clamps are placed across the artery above and below the area of stenosis to stop blood flow. During this time, the carotid artery on the other side of the neck carries blood flow to the brain. The surgeon makes an incision in the artery over the blocked area. The plaque buildup is peeled out and removed (Fig. 5). The artery is then closed with tiny sutures and the clamps removed to allow blood flow to the brain. Figure 5. A carotid endarterectomy is a surgery to remove plaque from the area of the carotid artery where the internal and external carotid arteries branch. Carotid endarterectomy is typically indicated for patients who have had symptoms (stroke or TIA) and have blockage greater than 50%. It is also recommended for patients who have no symptoms and have blockage greater than 60%. Among patients with moderate blockage of 50 to 69%, surgery reduces the risk of stroke by 6.5% over a five-year period. Among patients with high-grade blockage of more than 70%, the risk of stroke is reduced by 80% . The benefit of endarterectomy for patients whose stenosis is 50% or less does not outweigh the risks of the surgery. Carotid angioplasty / stenting is a minimally invasive endovascular procedure that compresses the plaque and widens the lumen of the artery. It is performed during an angiogram in a radiology suite. A flexible catheter is inserted in the femoral artery in the groin. It is guided through the blood stream past the heart, and into the carotid artery. Next, a small catheter with an inflatable balloon at the tip is positioned across the plaque (Fig. 6). The balloon is opened to dilate the artery and compress the plaque against the artery wall. The balloon is then deflated and removed. 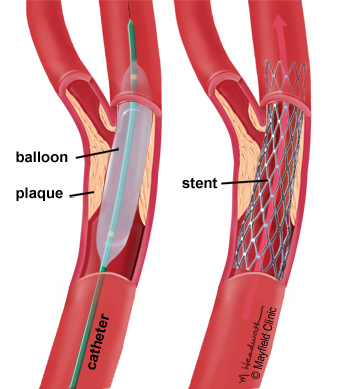 Finally, a self-expanding mesh-like tube called a stent is placed over the plaque, holding open the artery. Angioplasty / stenting is typically indicated for select patients who 1) have moderate to high-grade carotid stenosis greater than 70%; 2) have other medical conditions that increase the risk of surgical complications; 3) have recurrent stenosis; or 4) have stenosis that was caused by prior radiation therapy . Figure 6. During angioplasty, a balloon-tipped catheter is placed within the narrowed vessel. The balloon is inflated compressing the plaque and opening the artery. The balloon is removed and a self-expanding mesh stent is placed over the plaque to hold open the artery. The stent remains in the artery permanently. Carotid artery bypass is a surgery that reroutes the blood supply around the plaque-blocked area. A length of artery or vein is harvested from somewhere else in the body, usually the saphenous vein in the leg or the ulnar or radial arteries in the arm. The vessel graft is connected above and below the blockage so that blood flow is rerouted (bypassed) through the graft. Bypass is typically only used when the carotid is 100% blocked (carotid occlusion). Depending on your risk factors, your physician may ask you to stop smoking, limit heavy alcohol consumption, maintain good blood-sugar control (if you have diabetes), have your cholesterol checked regularly, and take medications as prescribed. It’s important to remember that carotid stenosis is a progressive disease. If left untreated, carotid stenosis has a stroke rate of 13% per year  in people with symptoms and 2.2% per year  in people without symptoms. Do not ignore the early warning signs! After carotid endarterectomy, restenosis can occur in less than two years and is usually not symptomatic. These regrown plaques can be treated with angioplasty and stenting. The plaques may regress with time, and intervention is reserved for stenosis greater than 80%. After two years, restenosis is more often related to progression of atherosclerotic disease. In general, repeat surgery or stenting is advised for symptomatic restenosis or stenosis greater than 80%. angioplasty: an endovascular procedure with a balloon-tipped catheter to enlarge a narrowing in an artery. atherosclerosis: a disease of the arterial blood vessels, in which the walls of the arteries become thickened and hardened by plaques. Plaques are composed of cholesterol and other lipids, inflammatory cells, and calcium deposits; also called "hardening of the arteries." fibromuscular dysplasia: abnormal cell growth in the artery walls that causes narrowing and a "string of beads" appearance; usually affects arteries of the kidneys and brain. ischemic stroke: a stroke caused by an interruption or blockage of oxygen-rich blood flow to an area of the brain; caused by a blood clot, atherosclerosis, vasospasm, or reduced blood pressure. transient ischemic attack (TIA): a "mini" stroke caused when blood flow to the brain is temporarily interrupted and then restored; causes no permanent brain damage. Mayfield Brain & Spine treats about 150 people with carotid artery disease each year. 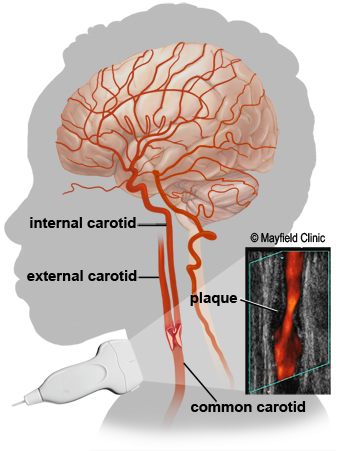 Rapid treatment of plaque buildup (atherosclerosis) in the carotid arteries can greatly reduce the risk of stroke. Our neurosurgeons and endovascular surgeons perform endarterectomy, balloon angioplasty / stenting, and carotid artery bypass. We work collaboratively with neurologists, neuroradiologists, and neurointensivists to bring you the very best care available. Dr. Lincoln Jiménez, a neurovascular specialist with Mayfield Brain & Spine, discusses the diagnosis and treatment options for carotid stenosis.